Nutmeg drying in the Banda islands. This low-grade nutmeg is known as BWP: "broken, wormy and punky". I welcomed 2012 while in the Banda islands, moderately famous because just one of the nine tiny islands of this isolated group was once thought to be a fair exchange for Manhattan, something I wrote about while a Reuters correspondent in these parts two decades ago. The differing fortunes of the two islands — the one still rich in nutmeg, the other now just plain rich — inspired Michael Schuman to give us this homily of protest at protectionism. He makes a sensible enough point; economies need to anticipate tomorrow’s needs rather than try to entrench today’s. Could the Dutch have anticipated that the perfidious Brits would smuggle nutmeg over to the similarly volcanic, sea-side location of Grenada and break the Dutch monopoly over the spice trade that way? Probably, yes. Could they have anticipated that the market for nutmeg would implode in large part because people got better at preserving ice and chilling food, and thus had less need for preservatives such as nutmeg? Maybe. Did they give a damn about the long-term prospects of the crop, or indeed the local population? The answer to the second part of the question is obvious: since the Dutch slaughtered most of the indigenous population in order to establish the monopoly, they were unlikely to be overly concerned with the continuing welfare of the slaves they imported to work the nutmeg plantations. 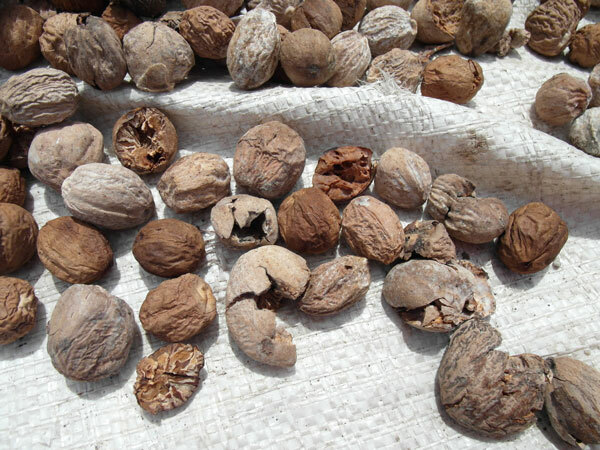 Whether they cared about the price of nutmeg in the long term is harder to guess at. Nutmeg provided a nice little bonanza for a while, but it was the vast sugar plantations of Java and rubber plantations of Sumatra that underwrote most of the development of the Netherlands, now one of the world’s more generous welfare states. Though by Michael Schuman’s standards the nutmeg growing islands of Indonesia are poor, it’s perhaps worth noting that, with the crop requiring virtually no work and nutmeg now fetching US$12.00 a kilo and the mace that covers it US$ 27.00 a kilo, the nutmeg planters of Banda are the envy of many people on other small, far-flung islands in Indonesia. I was interested to find a staunch defender of the Dutch in the form of the British naturalist Alfred Wallace — some say the true originator of Charles Darwin’s theories of evolution. Wallace spent 12 years wandering this part of the world killing things: shooting birds and pinning down butterflies mostly, though he did a fair bit of damage to the orang-utan species, too. Writing in the 1850s, long after the Brits were growing nutmeg elsewhere, he claims that the Dutch had a moral duty not only to monopolise nutmeg, but to destroy any excess trees that might raise production and lower the price. His logic is as follows: nutmeg is not a necessary commodity. It is not even used by the natives as a spice. (That’s still more or less true, though they do make some quite good jam out of the fruit that surrounds the nut). So raising the price does not hurt the local population. On the contrary, pushing up the price and putting the gains into state coffers provides a source of income for the state that would otherwise be raised from the local population in taxation. And we all know that taxes do hurt.